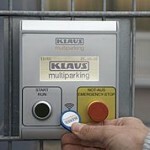 Multiparking system providing independent parking spaces for cars, one on top of the other and side by side. 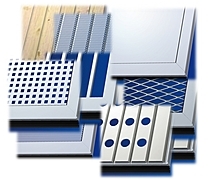 The system is a drive-through system combined with Trendvario 4100, 4200 and 4300 (for details about these systems please refer to the relevant product data sheets). Dimensions are in accordance with the underlying dimensions of height and width. The parking bays are accessed horinzotally (installation deviation ± 1 %). Along the complete width of the parking automat an approach lane (driving lane in accordance with local regulations) must be available. 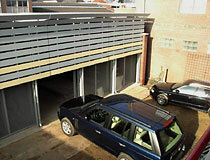 Parking spaces are arranged on two different levels, one level on top of the other. The platforms of the upper floor (UF) are moved vertically, the platforms on the ground floor (GF) horizontally. At approach level (GF) there is always one parking space less available. This vacant space is used forshifting the ground floor (GF) parking spaces sideways, thus enabling the upper platform (UF) parking space located above to be lowered to approach/ground level. 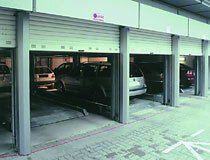 Consequently, a unit of three parking spaces (1 on the ground floor, 2 on the upper floor) is the smallest unit available for this parking system. 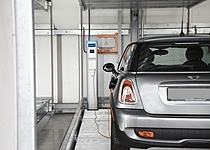 The parking automat Trendvario 4000 allows parking of passenger cars and station wagons. All necessary safety devices are installed. Safety devices mainly consist of chain monitoring system and locking levers for the upper platforms.Standard delivery is made without doors. The pproach/entrance area to the parking automat is monitored via light barriers. If the light barrier is interrupted, the parking system stops moving instantly.